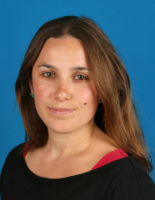 Laura Gemsemer studied General and Comparative Literature, Religious Studies, History of Art and Indian Art History at Freie Universität Berlin. Currently she is a doctoral fellow in the Topoi research group (C-2) Space and Metaphor and member of the PhD program Ancient Languages and Texts (ALT) at Berlin Graduate School of Ancient Studies (BerGSAS). Her PhD project, entitled Visio amoris et veneris – T(r)opische Imaginationen der Liebe im italienischen Spätmittelalter, deals with Giovanni Boccaccio’s poetics of love. Thesis analyses the literary strategies and narrative devices employed to depict love and its divine personifications.